Kansas City, Kansas is home to many great Mexican food restaurants. It seems that you can drive a couple miles from anywhere in the city, and find one. If we could, we would try them all. Unfortunately, like BBQ joints, there are just too many. One we enjoy when we are in the KU area is Taco Republic. It is located in the Rosedale section of town, and sits right on the south edge of the county line. Upon arriving you are given the choice of dining inside or out front on the patio. 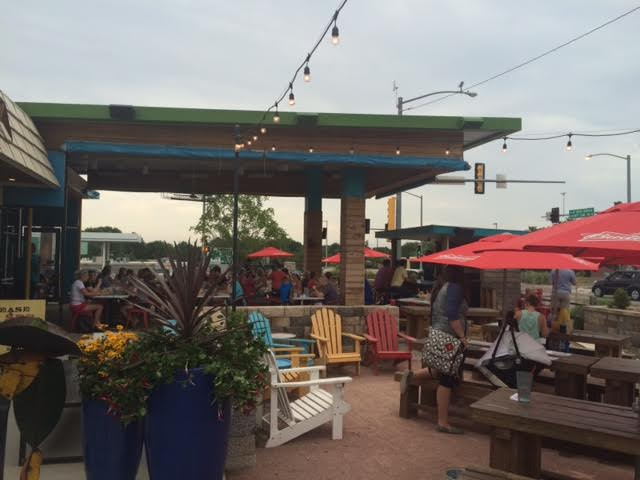 The patio does look to be a fun place to be, when the weather is cooperating. It reminds us of a patio party from the late 1960’s, with all of the bright colors. It will certainly be on our list of things to do later this year. Once seated, you are served the standard chips and salsa. Their chips are thicker than many other restaurants, which produces a heartier crunch. It also means that chips are less likely to break during dipping, which is a good thing in our opinion. During this visit to Taco republic we were there toward the tail end of their Happy Hour, so we chose to have the queso dip and a couple of the house margaritas. The Happy Hour menu is slim, but the prices are fantastic. The queso was run of the mill, but had good texture and flavor. 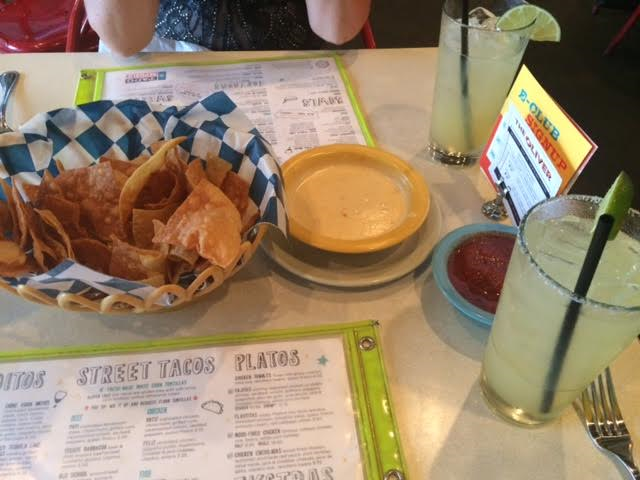 The margaritas were good sized, and larger than what many other places offer during the Happy Hour period. The menu has quite a few options, but for that evening we decided to focus on the tacos. 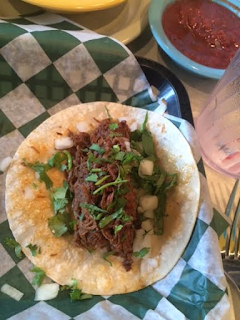 Taco Republic serves up “street tacos”, which come with a variety of meat and flavoring options. The Tecate Barbacoa, which contains flavored beef brisket, is tender and delicious It is served with onion and cilantro, which compliment the beef flavor. We also tested out four other flavors. From left to right we had; Del Mar (blackened tilapia), Cochinita Pibil (roasted pork), Ortiz (chimichurri chicken), and Old School with ground beef. Each version came with it’s own assembly of ingredients, which helped enhance the meats. All were eaten, but some were devoured with more gusto than others. By selecting a variety, we were able to find our favorites. It also allowed us to get a better understanding of the mix of flavors they have developed for each taco. On future visits we plan to sample other menu offerings such as: tostadas, tamales, or maybe the flautitas. We will also try to remember to leave a little room to try one of the desserts. All in all we were quite satisfied with our meal, and the service. Taco Republic will certainly be added to our long list of good restaurants in the city. We will also have to keep our eyes open for their food truck, when we attend outdoor events around town. Now if we could only find more time to visit all of these great places more often. 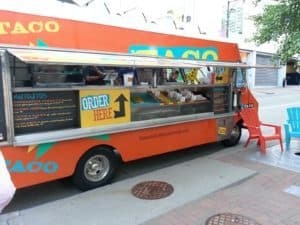 What are some of your favorite locations for “street tacos”? Let us know in the comment section below. Thanks!